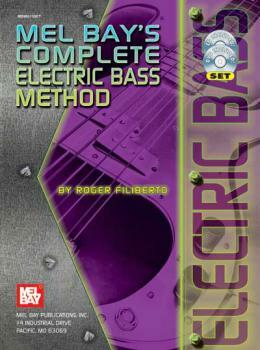 Eine einfuehrende Schule für angehende Bassisten mit einem Einstieg ins Notenlesen, Arpeggio Studien und vielen Übungen zu den gaengigen Musikstilen: While still available in two separate volumes (93234 and 93235) Roger Filiberto's widely-used beginning bass method is now available in one comprehensive book! Includes handy arpeggio charts featuring major, minor, augmented, diminished, and dominant seventh chords, plus their upper harmonic extensions. Applicable to any style of music, this method has gained widespread acceptance as the foundational text for electric bass study!